Product developers are reformulating in response to consumer concerns about “chemicals” and growing interest in simple and healthy eating. But, clean label has no established definition and consumers have many ways of defining it. In practice it seems to mean shortening ingredients lists and reducing them to familiar sounding, “kitchen cupboard” ingredients. Most often, this involves limiting or removing artificial colors, flavors and preservatives. At first glance, it appears that clean label is an overarching trend encompassing natural, non-GMO and organic. But organic certification is government regulated. How does clean label measure up? 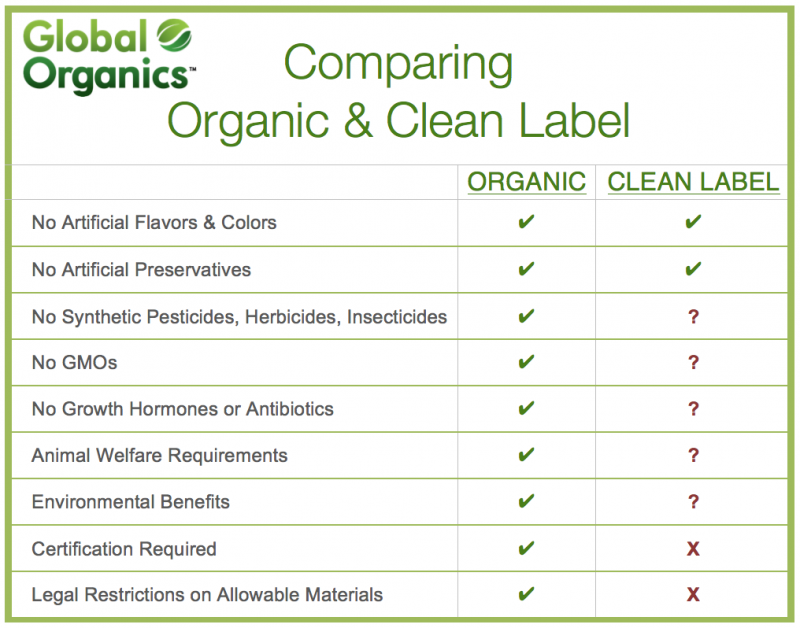 As it turns out, certified organic products are automatically clean label and much, much more. Organic standards prohibit most artificial flavors, colors and preservatives. However, organic standards go further and also prohibit synthetic agricultural inputs (pesticides, herbicides and insecticides), GMOs, growth hormones and antibiotics. Clean label products could still use all of these! What’s more, there are no audit or certification programs that guarantee a product is clean label. Certified organic has and will continue to be the gold standard for clear, clean labels and environmental sustainability. If you are cleaning up your label, you’re getting closer to the gold standard. Why not go all the way?